The 15th century cottage, sleeping 8, is situated in a beautiful, sheltered valley, a stone’s throw away from a remote Atlantic cove. Approached by a private drive from Hartland Abbey, through woodland which quite suddenly opens out to reveal a view of the cliffs and the sea, the cottage lies beside the Abbey stream. Its unique position and immense old fashioned charm make it a wonderful place to relax, enjoy the natural surroundings, and escape from the pressures of modern living. The cottage was used as a film location for Rosamunde Pilcher’s ‘The Shell Seekers’ with Vanessa Redgrave and Maximillian Schell and in 2007 for Andrew Davies’ adaptation for the BBC of ‘Sense and Sensibility’ with Dan Stevens, Dominic Cooper, David Morrissey, Janet McTeer and Charity Wakefield. In 2015 the BBC filmed scenes for ‘The Night Manager’ by John Le Carre with Hugh Laurie, Olivia Colman and Tom Hiddleston in and around the cottage. Scenes from the 2018 showing of ‘The Guernsey Literary and Potato Peel Pie Society’, with Lily James, Michael Huisman, Tom Courtenay, Penelope Wilton and Jessica Brown Finlay were shot close to the cottage. The South West Coastal footpath passes behind the cottage, making it a wonderful place to start a walk along the North Devon Coast towards the lighthouse and Clovelly or south to the Cornish border! The beach, with its rock pools, sandy gullies and unique cliff formation, is always interesting and at low tide prawns, mussels, limpets, star fish, crabs, lobsters and fish are to be found in the pools. They are also wonderful natural paddling pools for children. The sea is very clean and excellent for bathing and surfing, in the right conditions. 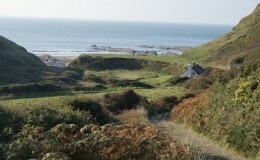 Very few other people can get to the beach as their only access is from the coastal footpath. In good weather, evening barbecuing on the beach, with the sun setting over the sea, and cooking your day’s catch, is magical. The only lights to be seen are from the lighthouses on Lundy Island. Hartland(2m) has wonderful small shops and a Post Office; we do ask guests to support local stores wherever possible. On booking we send guests a list of local shops, pubs, restaurants, attractions etc. Hartland Quay(1m walking 1 1/2m by car) has a good pub overlooking the Atlantic which is great fun for lunch or in the evening. Historic Hartland Abbey is 1m; Clovelly is only 5 miles away with its cobbled street, donkeys and lovely harbour. The cottage remains, purposely, largely unmodernised. The downstairs is beamed throughout and the sitting room has a huge open fireplace. The kitchen is open plan with stairs leading upstairs – a popular place for children to sit in anticipation of their next meal! (Gate at the top of the stairs) There is plenty of hot water. Central heating is included (Oct-April). Logs provided. Purposely there is no internet or TV but there is a CD and DVD player and TV monitor. Blackpool Mill is a true escape from the rat race! Wifi is provided free in the bar at Hartland Quay and at The Old Bakery Coffee Shop in the Square in Hartland. 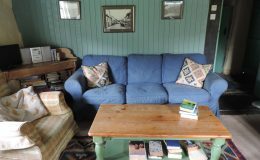 ACCOMMODATION Upstairs: 2 kingsize doubles, 1 with extra bed and ensuite shower, basin, wc, 2 interconnecting twin- bedded rooms: Downstairs: Sitting Room with large open fireplace and woodburner. 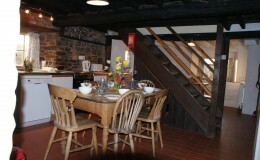 Large kitchen with oil-fired Rayburn, electric cooker, fridge/freezer, dishwasher, microwave and larder. Bathroom, basin and wc. BEDLINEN IS PROVIDED. Please supply your own towels, swimming towels and tea towels. The walks from the cottage are wonderful in all weathers; the beautiful rugged coastline combines with a profusion of wild flowers, butterflies and birds in summer, and bracing winds and huge seas in winter. Hartland Quay with it’s hotel and superb cliff scenery, Hartland point and lighthouse, Hartland Abbey and Gardens and St. Nectan’s Church are all within walking distance; Clovelly, Welcombe and Morwenstow are slightly further, but well within a day’s walk. Hartland with its Post Office, general stores, interesting craftsmen, artists, woodworkers and potteries is also easily walkable. A little further away, Bradworthy has very good, old fashioned shops. There is absolutely no need to go near a supermarket unless you want to! Bideford and Bude are approx. 30 minutes away by car. There are many other beautiful beaches within easy driving distance; there are houses and gardens open to the public, family attractions, excellent pubs and restaurants and, of course, tea rooms! Hartland Abbey has delicious cream teas. Boat trips can be taken to Lundy Island from Clovelly or Bideford. Bideford, Barnstaple and Bude are all within 30 minutes drive: Exmoor and Dartmoor are approx 1 hour’s drive. Junction 27 on the M5 is approximately 1½ hours. On receipt of a deposit of 25% of the weekly rent, your booking will be confirmed. The balance is due six weeks before the holiday commences, on receipt of which further details will be forwarded to you, together with a helpful list of local services.